Osamu Suzuki, left, and VW CEO Martin Winterkorn sealed their alliance with a handshake in 2009. Suzuki now wants a divorce. BERLIN -- Volkswagen AG stood by its accusation that Suzuki Motor Corp. breached a partnership agreement by buying engines from Fiat S.p.A.
VW said the Japanese company's complaints that its honor has been breached were "theatrical." VW repeated that Suzuki has to "correct" an alleged contract violation stemming from its purchase of diesel engines from Fiat. The automaker was responding to Suzuki's demand on Thursday that VW retract its accusation of a contractual violation. Suzuki Chairman Osamu Suzuki said his company did not breach the partnership agreement. The allegation had "significantly disparaged Suzuki's honor," he said on Thursday. In response, VW said that it failed to understand how adhering to contractually defined rights can be defamatory. "From Volkswagen's perspective, every effort has been made from the start to continue the partnership," the company said. 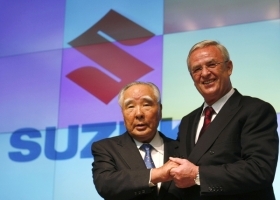 Suzuki said it had sent an official complaint to VW CEO Martin Winterkorn. VW confirmed that the letter was received and said: "Such theatrical actions are unhelpful in the current situation." Osamu Suzuki said on Sept. 13 he wants a "divorce" to end the 20-month-old carmaking alliance after VW's $2.9 billion investment failed to yield a single project. The relationship escalated into a public feud after the German carmaker, which owns 19.9 percent of Suzuki, said it could influence decisions at the Japanese manufacturer. Suzuki, which owns 1.49 percent of VW, plans to sell its holdings if the tie-up ends, the company said in a Sept. 12 statement to the Tokyo Stock Exchange. VW has said it doesn't plan to sell or reduce its stake in Suzuki. The stubborn stance of the two automakers means the companies are unlikely to resolve their differences, industry watchers say. "I can't conceive how this conflict can possibly be resolved," said Daniel Schwarz, a Frankfurt-based analyst at Commerzbank AG. "The chances are growing now that the partnership accord will be dissolved."